At Fun New York, we'll direct you to a variety of shops and online retailers that sell tuxedos for weddings in New York. Find wedding tuxedos in New York quickly and easily, without scrambling around at the last minute, by searching through our comprehensive wedding guide. Some of the Most Affordable Wedding Tuxes in NY! A family owned and operated company, NYC Tux delivers superior quality tuxedos with a selection that is absolutely second to none! Whether you're looking to buy or rent a wedding tuxedo, NYC Tux is your go-to retailer. You'll also find all types of accessories from vests to hats to cufflinks. If that's not enough, the company even provides limo and party bus services! Reserve your tuxedo today and take advantage of same day service. After you make your reservation online, you can pick it up at the shop on the same day! A one-stop shop for all your formal event needs, NYC Tux boasts some of the biggest promotional offers in all of NYC. DanteZeller's selection of formal wear for men is unique. You can choose from the widest variety of the newest styles and colors among designers such as Calvin Klein, Ralph Lauren, Joseph Abboud, Ike Behar and many others. If you want to look great on that special day, don't spend your time by looking elsewhere; DanteZeller will make sure that happens. Its tuxedo ensembles are offered in black, brown, white, periwinkle, gray, ivory and tan; and matching tuxedo vests and accessories, too. You will be able to mix match fabrics, patterns and colors and create a look that is uniquely yours. In the recent years there has been a big change in the way that men think about their dressing – they have started to actually think about dressing. The pleasures of dressing is being rediscovered by new generations that have been tired of the dismayingly unoriginal and the oppressively casual. Men may no longer have to wear a suit – but now they get to wear a suit. Nearly a century later, Beckenstein's grandsons, Neal Boyarsky and his son Jonathan have expanded and transformed the once one room store, into an unstoppable fabric enterprise, servicing the celebrities, government officials, the entertainment industry, and athletes worldwide. The company's success is attributed to the family's unwavering commitment on the one hand, and to their exclusive, joint partnership with Scabel of Brussels on the other, who manufactures the finest fabrics. So, in addition to the incomparable quality and the endless variety of fabric that Beckenstein offers, the company also provides its customers with unrivaled service by delivering stock fabric overnight. Their suits come to you! Bindle and Keep is a bespoke menswear company in Brooklyn, NY that endeavors to provide you with the best fabrics, an unparalleled attention to detail, and a white-glove client service. They tailor their suits, shirts, and jackets to your sartorial tastes and exacting specifications. They strive for a four week turnaround time, from the initial consultation to delivery of the product. Bindle & Keep maintains a wide array of fabrics. Woven in Italy and England, they carry hundreds of the finest cashmeres, wools and tweeds for all of your suiting needs. They also feature private appointments in all of the New York City area, at the time and place of the client's choosing. At Alan David Custom, every custom suit and tuxedo produced is backed by four generations of expertise in pattern making, measuring and tailoring. Their old-world custom tailors create the finest handmade tailored custom suits available today. All Alan David custom suits are hand sewn in a family-owned New York City workshop; nothing is outsourced or produced overseas. This allows them to make sure that every garment is made to the highest possible standards. They do not manufacture ready-to-wear or made-to-measure garments. On the contrary, their custom made clothing process begins with a carefully drafted, individual pattern created especially for each client. For twenty-five years Dino Baldini has provided New York City's men with custom garments of high quality. It's a family-owned company that features brands which define luxury Italian menswear, like Brioni and Pal Zileri, and top tailors create each client’s attire to satisfaction. Dino Baldini combines the highest quality, individual service and exceptional tailoring, creating an experience both personal and luxurious as a custom garment. Dino Baldini’s team provides an outstanding service, meeting the needs of clients every time. The times in your life when you'll be wearing a tuxedo will be some of the most special times! They will be the times that you should look and feel your very best. The high quality of the rental tuxedo you'll receive from any NYCTUX Tuxedo Shop is the most superior to the quality of any tuxedo you can purchase for $99. And there is no question - you will look and feel nice and comfortable in a higher quality tuxedo. You can either purchase or rent your tuxedo. If you decide that you want to purchase a tuxedo, keep in mind that you can do it from NYCTUX. 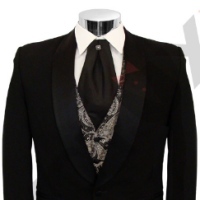 In addition to many of their rental garments being available for sale, also new tuxedos are available for purchase. Tuxedo Junction was founded in Buffalo, in 1969. They started with one small store, and like many start-up businesses they had a lot of energy but not much capital. The only advertising they could afford was word of mouth, and that's the reason they worked very hard to make every customer feel special. The same approach is still the basis of their business philosophy. Their mission is to make you look and feel great on your special day. They have grown considerably since 1969 and now operate many stores across the USA. Tuxego has a unique approach in presenting its tuxedos to wedding couples that are both informative and fun. By appointment they provide a complimentary formal wear personalized consultation for each client so that he can make an informed decision on the essence of the perfect style for him. Expert consultants insure that each customer receives a high quality service that is needed in choosing the best fit, look and value from a large selection of tuxedo styles, colors and accessories. Most important to Tuxego is that their clients look and feel special on their special day. Custom Men was established in 1996, and it is a family owned and operated business located in mid-town New York City. They design and tailor custom made shirts, tuxedos, bespoke suits and other formal wear. At Custom Men, they take pride in exceptional service and workmanship and it shows. They are passionate that a made to measure suit or a bespoke from Custom Men is the best you will ever own. And one of their tailors will surely check to ensure the perfect fit. Operation Hours: Monday-Friday 10 a.m. - 8 p.m., Saturday 10 a.m. - 5 p.m. Sunday is by appointment.